Fiji’s prime minister said his island nation would compensate soldiers exposed to radiation during British nuclear tests in the Pacific more than 56 years ago. The British government has refused to pay any compensation, but Prime Minister Voreqe Bainimarama said Fiji could wait no longer. “We are righting a wrong. We are closing an unfortunate chapter in our history,” Bainimarama said at a ceremony recognizing the suffering of the veterans. “We are bringing justice to a brave and proud group of Fijians to whom a great injustice was done. Veterans and their families have campaigned for decades to get payouts for their health problems. More than 70 Fijians were stationed on Kiritimati, then known as Christmas Island, during the 1957 and 1958 nuclear tests during the Cold War. As a result, they suffered serious health problems, including leukemia and other blood disorders, due to the radiation they were exposed to. The 24 survivors who attended the ceremony each received Fiji$9,855 (£3,181) from a compensation pool of Fiji$2.95 million (£950,000). “We were only told that we will go there to test some weapons, but when we got there we found out that we were brought there to be part of the British test of weapons of mass destruction,” survivor Naibuka Naicegulevu, 76, whose job was to clean and repair vehicles on the island, told AFP. “My two sons, now in their early 30s, get sick suddenly and they can be ill for one week, sometimes more, this is all because of the radiation that we were exposed to,” he added. 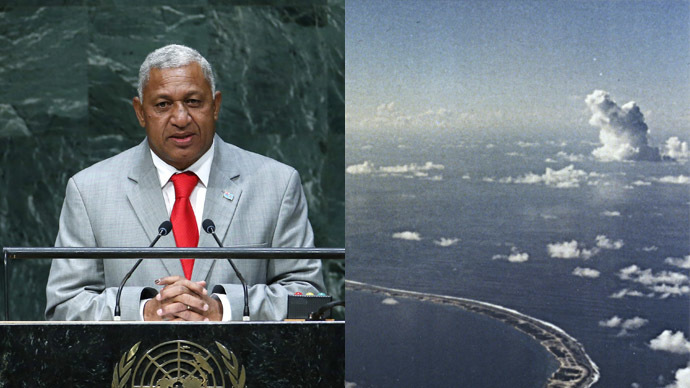 Bainimarama said Fiji, which was a Crown colony until 1970, could no longer afford to wait for Britain to take the lead on compensation. “The ranks of these survivors are rapidly thinning. Too many men – our fellow Fijians – have gone to their graves without justice. Those who remain deserve justice and Fiji as a nation is determined for them to finally get it,” he said.